Kearsarge may be a short run, but it is as rocky as they come in places. The summit is wide open though and gives great views of the Whites and the Mt. Washington Valley. 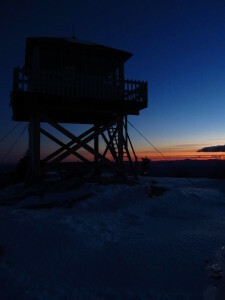 A nice enclosed fire tower on the top of Kearsarge awaits you for your efforts. There is an alternate route down the back side via the Shingle Pond Trail, which is only for the brave and those willing to get muddy in the summer when it is overgrown. Directions: Take Hurricane Mt. Rd. from Rt. 16/302 in North Conway. You’ll see the trailhead on the left. July 20th, 2019- Bucks for Bernie is back! Stay tuned for more details! Donna Cormier Therapeutic Massage--15% Discount on all Massage Services. Stan and Dan Sports–See Stan and Dan’s for a Discount on your new Hoka Shoes.